Edwin Boyd died in 2002, but he would be smiling to see his name in headlines once again. Toronto’s most infamous criminal always wanted to be the centre of attention, a Hollywood star like James Cagney. Edwin Boyd: Citizen Gangster is a beautifully shot period piece with terrific performances from Scott Speedman, Kevin Durand, Kelly Reilly, Charlotte Sullivan, Brian Cox and Beach resident Melanie Scrofano. A wintry Sault Ste. Marie stands in for post-war Toronto. The film won the Best First Canadian Feature prize at TIFF for director Nathan Morlando. 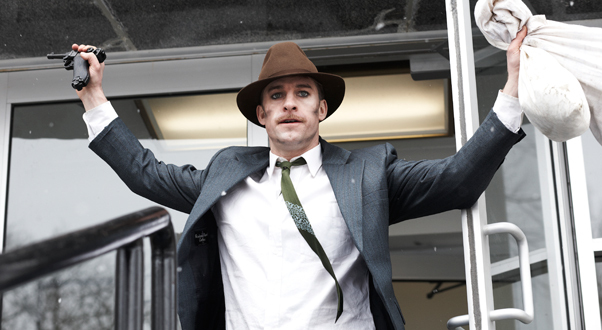 Scott Speedman as the titular criminal in Edwin Alonzo Boyd: the Story of the Notorious Boyd Gang. Boyd helped Morlando write the script, which may explain the sympathetic portrayal of a charming ‘gentleman’ bank robber. The real Edwin Boyd was a much more disturbing character. Late in life he made the chilling confession, “I did a few things that could have got me hung.” For the full story read Brian Vallee’s book, Edwin Alonzo Boyd: the Story of the Notorious Boyd Gang (1997). In the summer of 1928, 14-year-old Ed decided to run off and join the French Foreign Legion. His parents would need to believe that he was dead. He rode an old bicycle down to the beach at the foot of Woodbine Avenue and piled some clothes and a pair of running shoes on the sand. In a shirt pocket Ed left a paper with his name on it. His plan was to walk east on Kingston Road to Oshawa the first day. He got as far as Whitby. Police dragged the lake for hours looking for his body. Glover Boyd couldn’t have been pleased – Eddie’s father was a Toronto constable, walking the beat for 25 years. Ed had the bad luck to be born in 1914, not long before his dad went overseas to fight in World War One. When Glover Boyd returned home in 1919, the young boy was replaced in his mother’s arms by a man he didn’t know. His stern and religious father became a policeman at Number 10 Station on Main Street, now Community Centre 55. It was a short walk over the bridge from the family home on Harris Avenue near the Danforth. The Boyds moved to Chisholm Avenue and Glebemount Avenue with Ed attending Gledhill, Secord and Earl Beatty Schools. He excelled at sports and music, but had no interest in the three ‘Rs’ and especially didn’t like to follow rules. With a policeman for a father, Ed impressed his friends by getting into trouble. He never made it to high school. His mom’s death had a devastating effect on Ed at 15. He soon quit school and left home. By 1930 he was a drifter out west, riding the rails, surviving the Depression by conning women, odd jobs and petty theft. At 22, ‘Eddie’ Boyd robbed a gas station and spent two and a half years in a penitentiary. When the Second World War came along in 1939, hobos became heroes. Eddie served in France, but didn’t like army rules and became a military policeman of all things. Citizen Gangster picks up the story with Eddie returning home from overseas, a British war bride and three kids in tow. He got a good job as a TTC streetcar motorman on the Yonge Street line (not a bus driver as in the movie). More rules! Boyd was soon bored with routine civilian life. (Maybe he got tired of waiting for the Yonge subway to be finished in 1954). Between 1949 and 1952, Boyd committed at least 11 bank robberies and escaped from the Don Jail twice, sparking a media frenzy and the largest manhunt in Canadian history. The very first CBC Toronto television newscast shows Lorne Greene (the ‘Voice of Canada’ and later the patriarch on Bonanza) reporting on the dramatic events. Ironically, Boyd wanted to attend Greene’s Academy of Radio Arts under the delusion that a 35-year-old ex-con could become a Hollywood star by flashing his smile. After conversations with Boyd, director Morlando “realized that he had suffered an immense amount of loss. He had lost his family. It was a tragic love story.” Also, “He had the courage to reach for an extraordinary life.” How much ‘courage’ and ‘charm’ does it take to put a gun in a female bank teller’s face? Our city was terrorized by a ruthless gang. Bullets flew in bank holdups and shootouts with lawmen. Two policemen were shot in the line of duty. Even from the grave, the con man is fooling people. Some reviewers have fallen for the ‘decent family man’ myth, even writing about Boyd working as a film extra or actor. Film and TV production was non-existent in the 1940s in Toronto. NOW magazine called Boyd “a failed actor” (he never even tried), “dismayed by public indifference towards war veterans” (an ex-con with a grade seven education given a good TTC job and throwing it away), and a “family man and impoverished war veteran” (between the war, on the run and in prison, he must have spent about five minutes with his kids. His own father helped him financially). Boyd robbed the Bank of Toronto at 1436 Kingston Rd. near Warden of $10,000 in June 1952, one of what critic Rex Reed calls “friendly, nonviolent attempts to relieve banks of a few piles of small bills.” He engaged in shootouts with armed bank managers. Boyd was arrested with five guns by his bedside. Do we glorify violence and glamorize criminals? The movies have always loved gangsters, making folk heroes of thugs like Bonnie and Clyde. It’s exciting to see that rarest of films, one about a part of Toronto history. Just know that Edwin Boyd was no hero and anything but a ‘model citizen’. There won’t be any movies made about popular detective Eddie Tong. Now there was a hero. Once again, I’m forced to read through opinion’s based soley on feelings versus facts. It’s annoying when trying to research anything on the net these days. There are way too many people who have to ram their personal opinion down your throat. I’m not five years old. I know the difference between movies and reality. Who is the author to say what kind of man Edwin Boyd was? Or what kind of father? There is always 3 sides to EVERY story, his, hers and THE TRUTH. I’m unaware of anyone calling him a hero, so get off your soap box. Unless you have walked in someone’s shoes, you have no idea what his thought process was, his beliefs, loves and losses. I know thats right I agree with you 100% Michelle!!! The reality is that he was a ruthless thug, and is surely on his way to a burning hell. Had the movie depicted that, it would have surely helped those who may be following this path, instead of justifying them. I wonder if the wife of Edmund Tong would have liked to hear your sentimental rant. Yes, this sounds exactly like ex-con bashing. I’ve been to prison too, but I’m trying to change and go right too. Cons don’t always want to be bad, but sometimes once it starts it’s a hard thing to get out of. People don’t always want to give you a chance to straighten out. Like here they want to kick you back down, and keep kicking you long after you’ve payed for your crime. Ed paed. Doesn’t mean he was just a no good con, or phsychopath trying to portray himself as a good person. I would have loved to meet Ed Boyd. Back then things were very different, and the banks were very hard with people. They did take a lot of property from poor people that couldn’t pay the loans. I’m not saying this justifies anything. I’m sure that Ed enjoyed the excitement of it all, and getting that big cash all at once. I would have joined him back then. I consider it incredible that after serving his prison sentence, Boyd relocated to British Columbia where he became a caretaker for a disabled woman. I recently learned this from a TV documentary about Boyd. He was forced to move to BC by the powers that be, cops, politicians. frenzy about him at the time. but his wife, Doreen, had moved on and re-married someone else. Facts that aren’t mentioned in the movie (not sure about the books). Oh she also said they were very polite. You ask how can I say what kind of man Edwin Boyd was. From the CBC, “2002, Edwin Boyd tells a fifth estate producer he murdered a man and a woman and dumped their bodies in Toronto’s High Park. The details of the crime fit the Sept. 11, 1947 murders of Iris Scott and George Vigus.” My wife and I have been the injured victims of armed robbery. It is not polite or charming. Walk in the steps of the families of those murdered in cold-blood by the Boyd Gang, including policeman Eddie Tong who stopped their car. I researched this article and have a right to voice my opinion about a sympathetic movie which Boyd himself helped to write and makes him out to be a hero. Eddie started young, stealing from neighbours when he knew they were at Mass. At 14, he faked his death. In 1962, he called the police on his ex-wife after an altercation. He broke parole and went back to jail until 1966. He married a disabled woman in B.C. Nobody forced you to read my article, nobody put a gun to your head…that’s more Edwin Boyd’s style. Hi Kev, you are not telling me that Micky Metronitz married Daisy B. Sparkman> Do you mean Gary Kelly from Winnipeg? My dad’s great uncle was Edwin Boyd!! Our family has a lot of stories. My grandmother Jean Dart was the niece of Uncle Edwin. I am 85 and remember the case well. The murderd girl was from a devoted catholic family and having an affair. Her own brother was suspected by some family members of possible killing his sister. girl and returned to jail. Boyd caused a lot of real grief to a lot of people. He certainly was not an hero! Could you clarify what is so awful about disabled people, such that you offer Edwin Boyd’s choosing to marry one as further evidence of how far he was from being a “model citizen”? I get that he could have done so for despicable – though not necessarily criminal – reasons, like obtaining a large inheritance. But you didn’t provide further context of any kind for your statement, and until you do, this statement is very offensive. Considering that Edwin Boyd met this disabled woman at work (he drove a bus for disabled people, and she was a passenger on the bus), married her, and then took care of her for the next 35 years (at which point, they moved into a retirement home together), it appears he finally decided to live a decent, law-abiding life. I am not excusing him for any of his earlier crimes, whether or not he was ever charged with or convicted of them – that simply is not my place or within my power. Even if there were other crimes he could have been convicted of, and even if he could have received the death penalty for them, the facts are that he served his time and so was deemed to have paid his debt to society, and from that point forward he got into no further trouble with the law. I give Edwin Boyd credit for becoming a better human being for the final third of his life. Personally, I think the reasons behind that significant change would be more interesting to understand and discuss than repeatedly rehashing any of his crimes. I am the grandson of Sam Stone, brother to Leonard Jackson and member of the Leonard Jackson gang, as it was originally called. My grandfather was a career criminal. A fact I take no pride in. It was he that influenced Leonard to follow the path he did through excample. His first crime was robbery with violence, commited in Niagra Falls, Ontario when he was 18 years old. He was sentenced to 3 years and served at the Victoria reform school till his release at age 21. During the depression he became as so many others a hobo. He road the rails and finaly settled down somewhat in Hamilton, Ontario, where he met my grandmother Bertha Wright. Sam always kept a low profile and was never a braggert. He is the one member of the gang never to be identified. He knew Edward Boyd well and despised him. He always said of him that Boyd was a rat and a murderer. When Leonard brought him into the gang my grandfather pulled a robbery on his own so that he could get caught. He was sentenced to 12 years in Kingston Penn. He felt fortunate because he knew that no good would come of Boyd joining the gang. It was the newspaper wars in the late 40’s and early 50’s that elevated Boyd’s status. Boyd’d ego could not be contained. He was always seeking headlines at the cost of the other members of the gang. He was no gentleman. My grandfather while in Kingston Penn would gather intellegence and sister Mary Mitchell would pass it on to Leonard allowing Leonard to stay one step ahead of Edmund Tong who had become obsessed with capturing the gang. Leonard Jackson was the leader of the gang. He along with Steve Suchan hung at the Don Jail in Toronto after Suchan shot and killed Edmund Tong and wounded Officer Roy Perry. I judged Edwin too, Michelle, when was (I thought) learning about his life. It was a gut reaction, a state of temporary insanity, to think that I can truly judge another human being, never mind one I’ve never laid eyes one. How often have we all been wrong in judgments of our loved ones & ourselves, never mind a stranger? How many cherished scientific theories (the evidence based judgements of cool-headed Nobel Prize winners with brains the size of a small planet) have we had to discard or modify in the light of fuller knowledge? As human beings with limited facts at our disposal and limited understanding of what facts we may have, we should be truthful with ourselves and accept that judgement of others foolish. If you want your loved ones to be happy, show compassion. And if you want to be happy -show compassion. Too bad it’s so habit-forming in our culture. Thank God that our culture continues to evolve. Thank you for your philosophical letter. I agree compassion is a good emotion. I wonder how much compassion Boyd felt as he strangled the life out of a 22 year-old girl in High Park. How much terror did she feel watching her male friend murdered in front of her eyes knowing she was about to die, stuffed in the trunk of a car for Boyd’s thrill? Even other career criminals described Boyd as a “rat and a murderer” (see above). How much compassion did the Boyd Gang show Constable Eddie Tong, shot dead before he even drew his gun? Every day we ask policemen to protect us from thugs and psychopaths like Boyd. If Boyd hadn’t gone to jail, who knows how many of us he would have robbed and/or murdered in cold blood. Boyd got to live out his life. Sorry, I don’t have much compassion for him and I will judge him based on the facts and his own confession of guilt. Evil should be judged by others. Save the violins for someone who deserves our sympathy. I’m not sure if I believe Edwin Boyd’s confession to murder. My reason? It sounds a lot like the confession Charles Starkweather made after killing a couple. In that, the girl told Starkweather that he seemed familiar and she was pretty sure he was wanted by the police, and she was going to advise them. Not knowing if she was serious or not, he killed the guy, raped the girl and killed her after. My opinion is that Edwin loved attention so much, that he was willing to lie about what he had done in life to get some. Lastly, the couple who were killed weren’t actually a couple. Iris Scott was working as an employee in George Vigus’s company. George was a married man with children. Basically, he was having an affair. Irrelevant, but still interesting to know. Interestingly enough, I know one of Constable Tong’s relatives … they have not forgotten that Boyd’s gang was responsible for the taking of a loved one’s life. Boyd had opportunities that he took away from Constable Tong’s children, grandchildren and great-grandchildren. He was only 48 when he was fatally shot (and his partner wounded) by members of the Boyd Gang. I’m saddended by the glorification of this criminal and murderer, and I quite agree with the writer’s sentiments. Most people play the hand they are dealt in life. As previously stated by Michelle, it appears he had some excruciating circumstances early on in his life that seemed to forge the path of life he was headed for. It’s unfortunate lives were lost during that path of destruction (though it appeared that 2 of the other more rogue gang members made that decision on their own), but I can bare witness for people who have great hearts & are loving family members but were put in undesirable predicaments and teetered on the other side of the law to better their situation. As The Lord Himself stated, “He without sin can cast the first stone”. You are all entitled to your opinion that Edwin Boyd deserves our sympathy, but frankly I am baffled as to why we should excuse his criminal behaviour. Do you have any facts to back up your opinion? Are you seriously suggesting that a man who strangled a 22-year-old girl to death for kicks may have had a “great heart”? Where are the “excruciating circumstances early on in his life”? Boyd grew up in a nice, detached house in a middle-class neighbourhood with a policeman for a father. He stole from neighbours when he knew they were at church. How much did he care about his parents when he faked his suicide at 14 to run away? His rationale for becoming a career criminal was “if it’s so easy to rob a bank, what the hell am I working for?” By 22, he was in prison. When he had a family and a good job, he threw it away. What “predicament” was he in? Working for a living? Murderers deserve to be judged and punished. Did you hear the one about the boy who ransacked his parents’ home and asked for sympathy because he came from a “broken home”. (If he killed his parents, would he merit sympathy as an “orphan”?) As for quoting Scripture, for the record, I am against stoning women to death for adultery. Fletcher should get off of the hysterical, axe-grinding grandstand. Boyd was obviously no choir boy, but he was never convicted, tried, charged, arrested, investigated or tied by evidence to the murder of anyone. Yet, Fletcher keeps harping on about him killing a 22-year-old girl for kicks. The only connection that Boyd had to the 1947 double homicide in question was that he said he killed a couple of people years before he started robbing banks. Nothing was ever proven in this regard, and his “confession” could have come from anyone who learned about this crime from reading the newspaper. In this, he could have been blowing smoke in an attempt to get a rise out of his listener, or wanted to add to the already well-established mystique of his reputation. Tong was not killed by Boyd, but rather by a couple of slobs affiliated with him while they were working on their own. To attempt to tie Boyd to this killing is totally disingenuous. Plenty of people follow lives of crime due to having low character, but that doesn’t make them psychopaths. Thieves, even armed ones, aren’t necessarily killers. And, I really have to question the opinion of a slimy career criminal when it comes to describing the lack of virtues in another career criminal. I don’t know why Fletcher has such a hardon for Boyd, but, I find it unseemly to be engaging in slams that border on the libelous about someone who isn’t alive anymore to defend themselves, even if that someone was a bank robber. Just saw the movie..thought it was an ok movie …then checked google…. now as for everyone that has commented on here ….take a pill..!!! And I stumbled onto this website. I read all the comments and got so infuriated with some of you guys. I mean really! ! There is nothing “cool” about a robber especially an armed one. I think you guys romanticize this in your head (probably want to escape your meaningless lives) and play right into Hollywood ‘s hands. If you want to FEEL what a robbery is like, come stay in South Africa for a while. The feeling of being totally impotent, and scared to death for your life and that of your family, is not very romantic, I can promise you that. I would like to encourage all of you to think while you’re watching a movie. Just think about the other guy. The victim (the real victim ) and what they went through. In life there aren’t good guys and bad guys. All persons are good people (nice people) who sometimes do bad things. But there are people who do it on purpose for their own gain. And stop feeling sorry for someone(or yourself) who had a bad life. Everyone know what’s right and what’s wrong. That’s what the law is all about. People choose to do bad things. Everyone had something bad happen to them some time or another. It does not exempt you from doing what is right. But seriously, stop living in a fantasy world. Make your own world better. Yooooo this movie was so freaking sad . I have mixed emotions right now. I wished Edwin was still alive I would have like to talk to him…. GO #TEAM BOYD! 99% of every word in this article is bias, lacking evidence, pointless and mainly opinion based. The man’s dead. Who cares if he robbed a few banks, and /or killed someone. He got his in the end whether he killed anyone or not. People do bad things regularly. It’s life. Deal with it. Oh, and Bernie, why didn’t you respond to Karloff’s very interesting opinion like you did to everyone else who had positive remarks about a man that they don’t know? Are you speechless due to his/her rather fact filled opinion? Boyd helped to write the movie script which gives a sentimental, sympathetic view of his life. There was no DNA evidence in 1947, no murder weapon and the only witnesses were murdered in a dark park. There was no chance of anyone being charged without a confession. Late in life Boyd confessed to the murders. The CBC and author Brian Vallee both came to the conclusion that Boyd was a murderer. Boyd told people he had committed murder before the bank robberies. He also said he had done things that would have seen him hanged. These are his words. In his last years he may have been remorseful. The fact that criminals who knew him considered Boyd “a rat and a murderer” is not just my opinion. Detective Tong was doing his job hunting down the bank robbers. If the Boyd Gang had not committed a dozen armed bank heists, the policeman would not have been killed. The robberies involved gunfire and it is a miracle no innocent bystander was killed. Bank managers were armed in those days. “Who cares if he robbed a few banks, and /or killed someone. He got his in the end whether he killed anyone or not.” What a callous comment. Read Barbara Holm’s letter above if you think no one cares if someone was killed. Boyd died peacefully of natural causes in his own bed. His victims never had that chance at a long life. I must say though, that I am impressed with how long the comments have kept this article active. Thanks for your reply Livetowin. Any writing about film involves opinion. This is not a news article, but my facts are taken from the book by the late Brian Vallee, an award-winning journalist and from the acclaimed CBC investigative journalism show “The Fifth Estate” which has won the Pulitzer Prize, Peabody, Polk and International Emmy Awards, plus an Academy Award. The movie about Boyd will likely be seen by millions of people. Movie reviewers like Rex Reed fell for the ‘misunderstood romantic hero’ Boyd fiction hook, line and sinker. I would be lucky to reach a few thousand people with this article to balance the sympathetic portrayal of the movie which Boyd himself helped write. How many people out there even know the names of the victims he confessed to murdering? Yes, I am guilty of being biased against violence and killers, but thanks for keeping the article active. hi. my father in law worked with boyd at ttc eglinton streetcar division. he was hired with a criminal record because his father was a cop. Thank you for your letter, Heather. I am sorry you read something into my factual statement that “he married a disabled woman in B.C.” I was not questioning his motives. I was responding to the writer who said that Boyd “became a caretaker for a disabled woman in B.C.” I just don’t see a husband as a “caretaker” which is a little condescending to the woman as if it is extra noble to marry someone with a disability. Maybe she was a beautiful, wonderful person and a great cook! I agree that Boyd became a law-abiding, older man who got to marry and live out a long life. You could argue that this is redemption for murder and robbery. I suspect Boyd had a guilty conscience late in life. As a Catholic this may have led Boyd to confess to the murders when he was near death. He may have regretted “doing things that would have got him hanged”, but he waited until it was too late for the police to make sure he “paid his debt to society”. Please read the heartfelt letter from Barbara Holm, the grand niece of Iris Scott who never got to marry or live out a long life. Hi Bernie, The fact that you state above that Boyd helped write the movie answers a lot of questions I have had. He romanticized his life to me when I was a child. Not until I was older did I get the full picture of what this man was about. Yes Boyd was the lowest of the low. Please do not waste any sympathy on this man. I just want you all to know that I knew Boyd from 1968 until his death in 2002. My father was his parole officer in B.C. He was never reformed or remorseful. He was a master manipulator until the very end. I could say so much more but they would not post it on here. The justice system failed to work in this case. After years of counselling I am still trying to recover from the harm this man has caused me and my family.